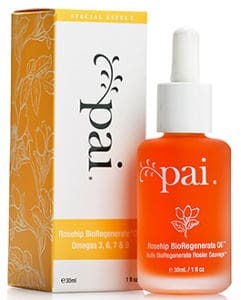 Pai Rosehip BioRegenerate Oil is a highly concentrated top quality natural oil that works wonders to repair damaged skin and regenerate it so that you feel it more vibrant and healthy. Other benefits you can enjoy is less visible fine lines and a more elastic and firm skin. Men’s skin suffers a lot of times from shaving irritations but many products on the market are full of harsh chemicals that can further irritate and harm their skin. Pai Organic Oil is a pure product that can not only cure skin from shaving irritations but can condition men’s beards wonderfully. Two or three drops of this oil can save you from irritations, repair skin damage and further protect your face from all sorts of deteriorating factors including aging. It is also suitable for the most sensitive skin types and in this review, you can read more about its benefits. Pai Skincare is a company that uses natural organic plant based ingredients to treat your skin and helps repair the damage that it has suffered over the years. Their rosehip oil helps the body generate natural vitamin A which is necessary for your skin to make those repairs. Clinical studies have shown that rosehip contains levels of all-trans retinoic acid which is a vitamin A acid that Retinol transforms to. This oil is also rich in omegas and other essential nutrients that nourish and repair the skin quickly. These ingredients make this product effective for scarring, sun damaged as well as sunburnt skin but also beneficial for dull dry skin, age spots and fine lines. An acne-prone complexion can also highly benefit from its use, making it more balanced and clear but it is also recommended for other conditions such as dermatitis, rosacea and eczema. This natural oil is actually a multi-tasker for both men’s and women’s skin. It can regenerate their skin in no time and make it feel really calm, happy and glowing. It contains no chemicals, parabens, or drying ingredients that can cause damage and irritate your skin. It quickly absorbs into the skin without blocking the pores and effectively moisturizes it while also creating a barrier that protects the skin from dehydration and other effects that are caused by different factors including environmental. Instead of cold pressing the rosehip oil from the plant, Pai uses a special CO2 process to extract both the oil and the rosehip bio-generate fruit which is loaded with carotene. It is then combined with a 100% natural vitamin E and bottled to be used by consumers to help repair and protect their skin. You simply put two or three drops of this oil on the palm of your hand and using your fingertips work it into your skin, making sure that you massage it in until the orange color of the oil completely disappears. The company states that it is best to use it as a night time treatment so that it further promotes and boosts the regenerating and healing process that anyway your skin is going through during the night to wake up with a pretty more vibrant and healthy skin. This product can be used on the face, body and nails. Several reviewers stated that using this product resulted in a softer more glowing skin. Some people experienced this glow after only a couple of uses while others used it for two or three weeks before they really began noticing the glow. Others reported that it healed their dry and irritated skin, reducing redness and leaving their face looking plumper and more healthy. A few people said that it healed old acne scars including a case where the scars still looked quite red and sore. Some users clearly stated that this oil is so effective that it has become part of their night time routine on a regular basis. All users mentioned that it does not feel greasy and absorbs very fast. Since, we ourselves are big fans of Pai Rosehip Oil and it has been a staple of our skincare routine, we can’t avoid not recommending it to you for a more vibrant, healthy looking, moisturized and calm skin away from irritations as well as a better protected complexion against environmental damage.